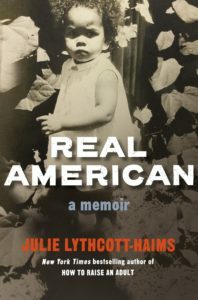 Julie Lythcott-Haims’ memoir Real American is about the author’s experience growing up biracial in America and how it shaped who she is. Lythcott-Haims, daughter of an African-American father and a white British mother, was born in Africa when her parents were working there, but moved as a young girl to the U.S. She lived in a few different places, some more racially diverse than others, and spent much of her life feeling conflicting about her mixed race. She didn’t have many black friends as a teenager, and in many ways she suppressed that side of herself in order to fit in. She went on to college and law school, eventually moved to California, and in her late 20s she took a job as a dean at Stanford. It wasn’t until that job at Stanford, and her marriage to a white man, that Lythcott-Haims really started investigating her relationship with race, her roots and the society into which she brought two mixed-race children. Real American is a collection of short, essay-like chapters (some as short as a few paragraphs) in which Lythcott-Haims explores her childhood and the emergence of her black identity. I really liked Real American. 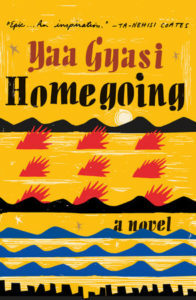 It’s an intensely personal book, written with unflinching honesty and inspired by strong feelings, and it opened a real window for me into what it is like to grow up black or mixed in this country. The author and I attended the same law school and lived for many years in the same place, but our experiences were very different. I honestly think everyone I know should read this book. I dogeared so many pages that moved me, way too many to try to include here. Toward the end of the book, Lythcott-Haims talks about Black Lives Matter and the series of police killings of black men and boys, and she relates her deep fear about her son’s safety as a dark-skinned boy. Really painful to read, especially as a mom of a young son myself. I could go on and on about this book. I am so glad I read it. It’s not always an easy read, but it is a good one, and surprisingly hard to put down. It comes out on October 3 – look for it then.